Spinners: Are you impatient, or possessing a short attention span? Do you tire of long stretches of spinning, eager to see how your yarn will knit up? Do you have a small spindle or bobbin, which holds hardly any yarn? If you answered yes to any of these questions, then this "socks on the fly" technique is worth a try. First, prepare your fiber. If you want your socks to match, split the braid in half lengthwise and predraft, or at least give the fiber a little fluff. Separate your fiber into pile A and pile B. Begin spinning from pile A, using the Navajo ply on the fly technique. This is a fantastic method, and I wouldn't navajo ply any other way! Once your spindle is full, you will have a cop full of 3-ply chain-plied yarn. Wind it off the spindle into a ball, and begin knitting Sock A.
Sock A is on the needles, now start spinning from fiber pile B, chain ply on the fly, wind off, cast on Sock B. Lather, rinse, repeat until you have a new pair of handspun socks. I started doing this because I am an impatient spinner, who takes ages to spin enough yarn for a pair of socks, always wants to see how my yarn knits up, and my spindle is tiny. When I was spinning for my Gail, I had to wind off the spindle 4 times, for only 2 ounces of fiber! So, if I was spinning it all first and then knitting it, I would have to keep joining the skeins anyway. I'm loving this project. I get to knit and spin at the same time, I get both socks at the same time, and my stripes match (mostly). 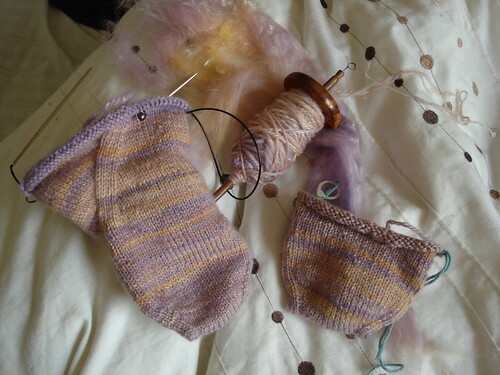 You could even adapt this method to knitting the socks 2AAT magic loop, but I don't like 2AAT, so I just put each sock on hold when it comes time to knit on the other sock. If you have two sets of needles, it's even easier.